← Love wins: always, always, always. 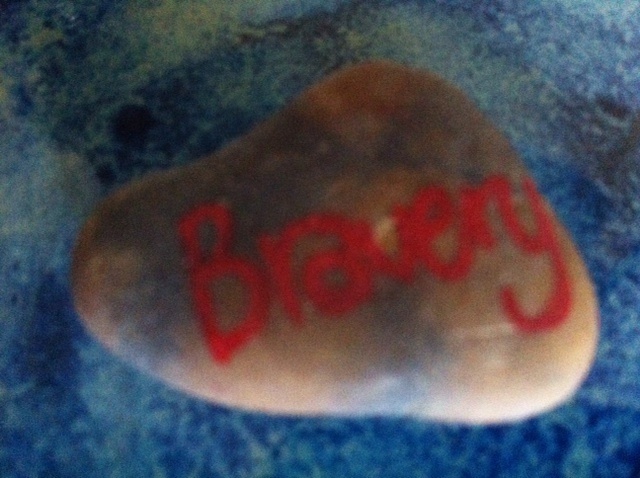 A dear friend told me recently, “You are very brave.” My inner critic was quick to tell me: Brave? Possibly. Or perhaps you are mildly crazy or deluded. I kept my mouth shut, but hoped my friend was right. My friend’s response, her affirmation of my courage, startled me. I certainly wasn’t feeling brave. I felt completely exposed, even a little light-headed, as I let the cat out of the bag and shared from my heart. And, yet, that’s what bravery is, what courage is. The word courage comes from middle English and Anglo-French meaning quite literally heart. Yesterday a friend sent me a link to Brené Brown’s most recent TED talk (http://www.ted.com/talks/brene_brown_listening_to_shame.html). Brown is still talking about shame though many wish she would avoid the word altogether. She has made peace with the idea that we all have shame, and that the way out for each of us is in acknowledging it. If we are willing to be vulnerable, if we can muster the courage to speak the truth, to step out of habitual silence, secrecy and judgment, then we have a chance for a life that is free and rich – a life that in Brown’s words is whole-hearted. I am blessed to be in community with a number of people who are willing to risk vulnerability in their lives. They show me how it’s done. They show me what it means not just to be a work in progress, being molded by the Holy Spirit, but also to be an active participant in the process of transformation. To actually be willing to do something different or try something new. When we boil it down, that’s what vulnerability is: action. As part of St. Francis In-the-Field’s Lenten Recovery Eucharist services, each Thursday during March a different person offers a reflection on his or her spiritual journey. We are gifted by the vulnerability of these brave souls, by their willingness to speak the truth about their personal journey toward wholeness, of coming into relationship with a power greater than themselves. They speak of their ambivalence around God and Church and how they have thrown themselves – their most vulnerable and at times shame-filled selves – at the possibility that God truly is Love, that God really does hold us in the palm of his hand no matter where we’ve been or where we may find ourselves now. That God delights at being in relationship with his creatures. We each have our own unique journey into which we are invited to live, but our journeys, if they are to be genuine and life-giving, are built from a common foundation of vulnerability and honesty. Soon we will follow Jesus into the garden of Gethsemane, into the place of his greatest vulnerability. He will show us yet again that if we are willing to risk it all — to act with a bravery that lays bare our heart of hearts — we will come to that Easter place of transformation that can be reached only through vulnerability. This entry was posted in 12-step spirituality, Christianity, Diocese of Florida, Episcopal church, faith, peace, Uncategorized and tagged 11th Step, 12 Steps, 12-step spirituality, community, Gethsemane, holy ground, hope, mercy, recovery, shame, simple prayer, vulnerability. Bookmark the permalink. It seems I always need to hear what you have to say…. and thank you for sharing that video. Food for my soul.